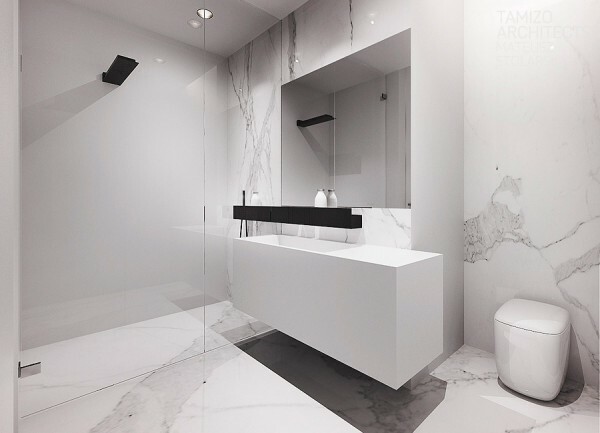 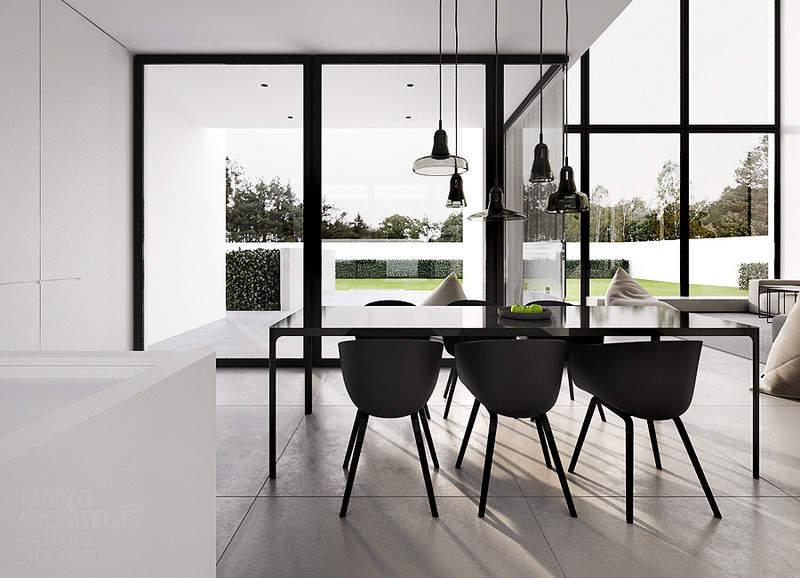 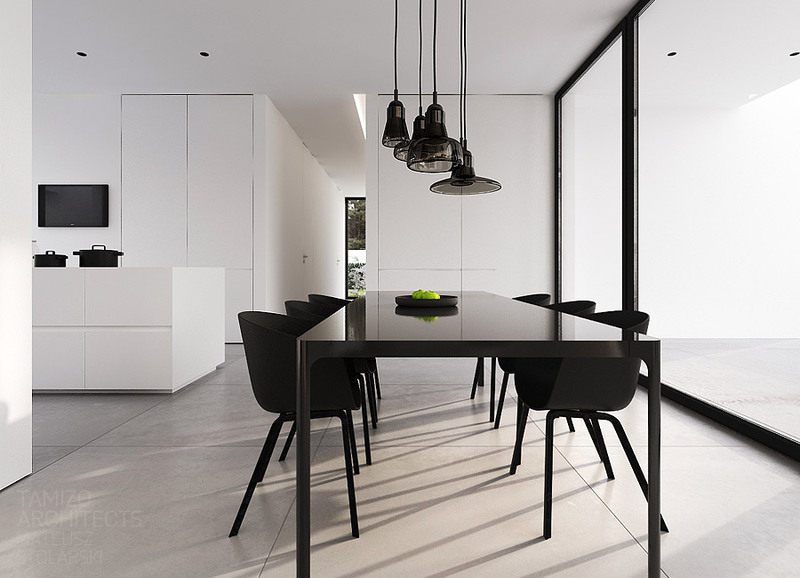 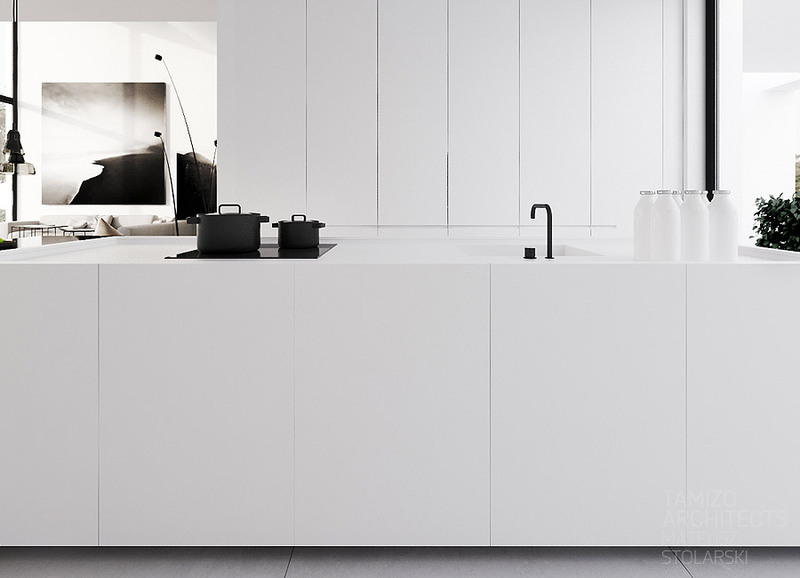 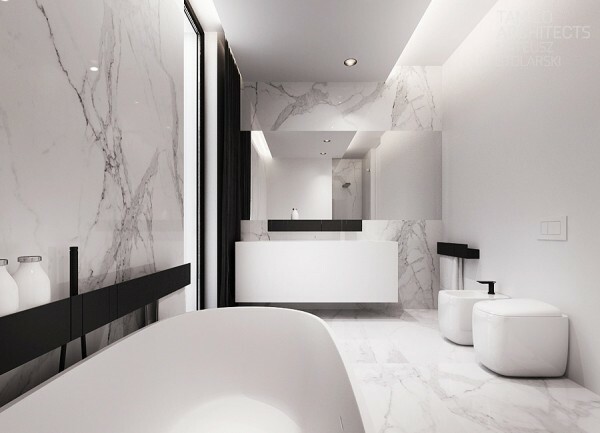 This clean interior design of a detached house in Warsaw, by Tamizo Architects, depicts a serene take on modern day living style, with a spacious open plan vision in high contrast black and white. 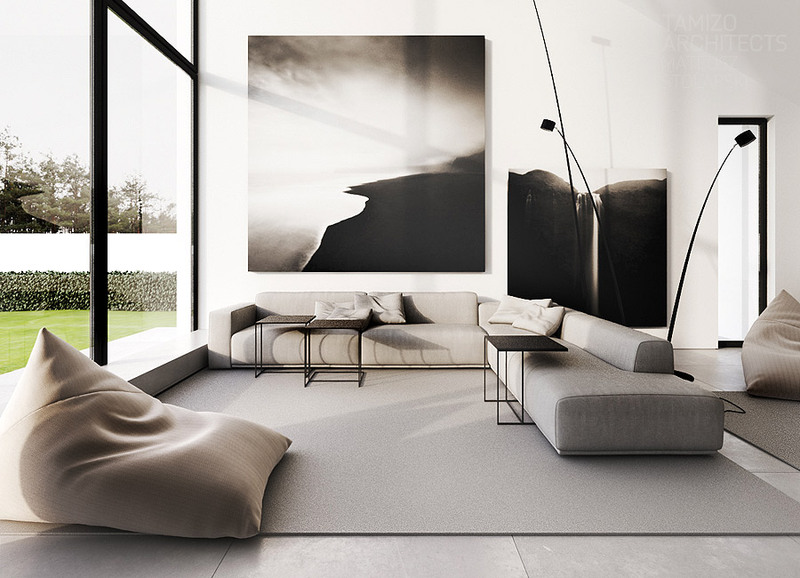 The smart-casual lounge is dotted with comfy but chic adult sized beans bags, providing easily moveable sitting places to read, relax, or group as a conversational area. 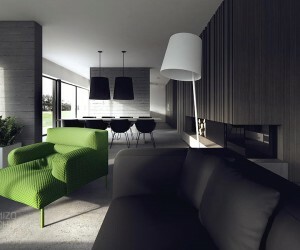 A large L-shaped sofa provides a more formal relaxation zone on which to enjoy the TV and movies. 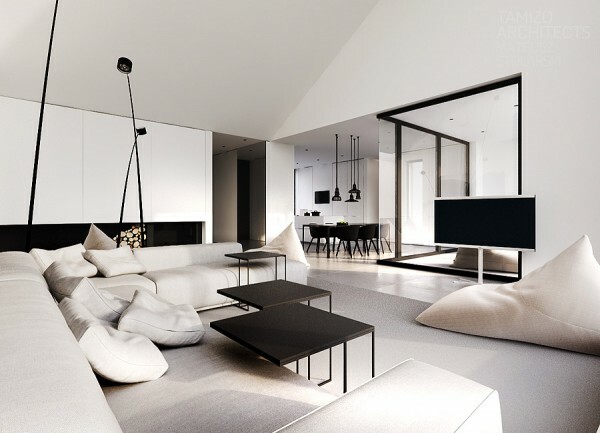 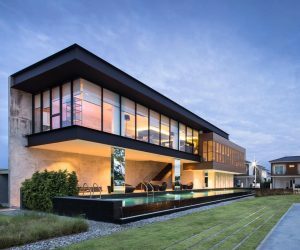 Massive works of art adorn the wall above the sofa, depicting dramatic landscapes in tones of black and white; these compliment the stark black window frames of the towering dual height windows. 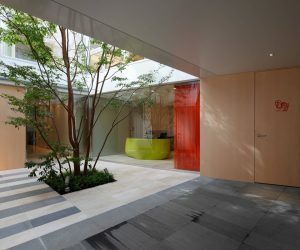 The garden is visible beyond the glazed wall. 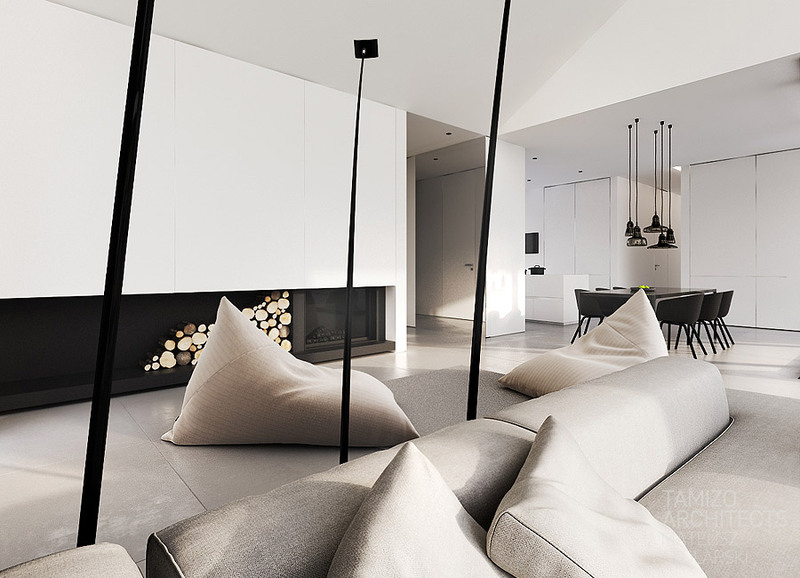 Elegant standing lamps appear to sprout out of the ground from spindly black stems. 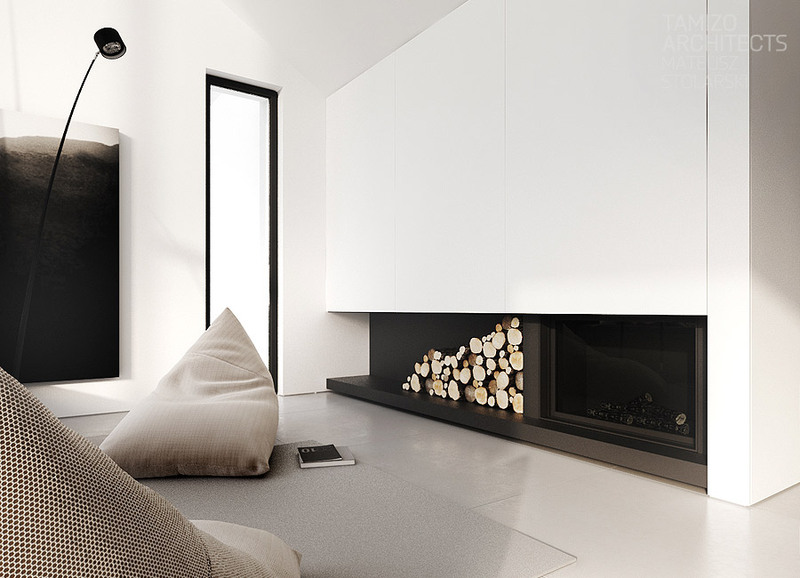 A contemporary wood burner stretches along one side of the living room with a plentiful supply of firewood nestled in a neighboring nook. 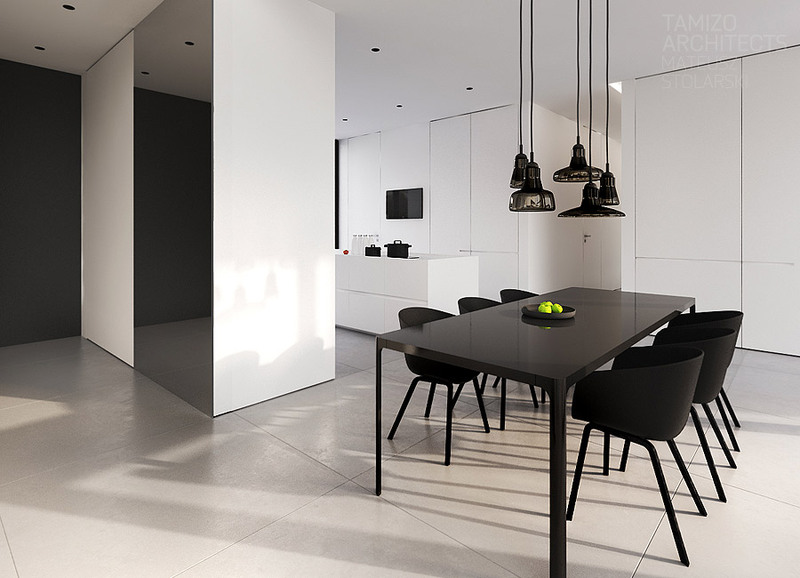 Over in the kitchen diner, the black and white theme continues with a bold black dining suite and ice white cabinetry. A cluster of pendant lights mark out the eating zone that also looks out on to the sweeping garden lawn. A sharp edged white island, accessorized with black, forms the centerpiece of the kitchen. 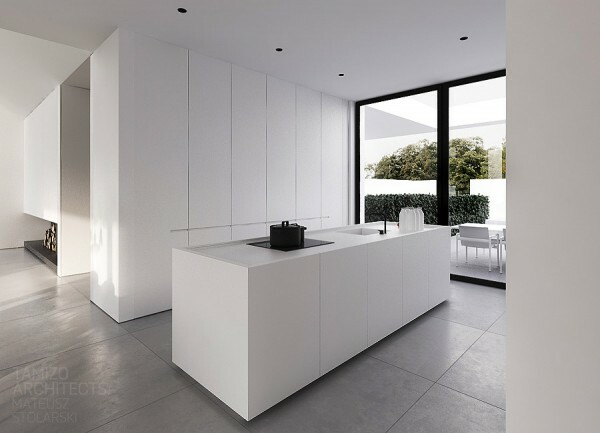 All of the units are without handles to maintain a smooth and uncluttered finish. 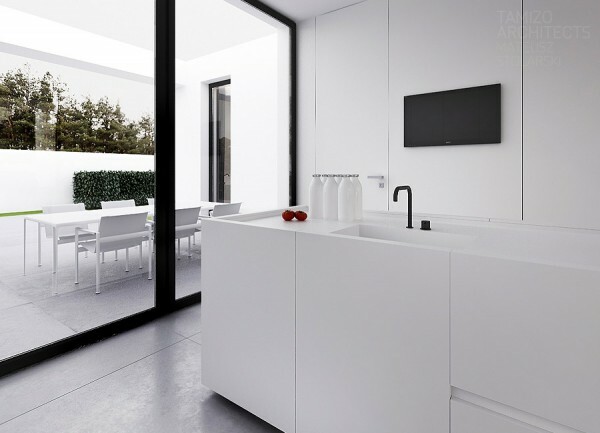 Out on the patio an understated alfresco dining set provides an elegant place for outdoor entertaining. The bedroom is kept absolutely simplistic. 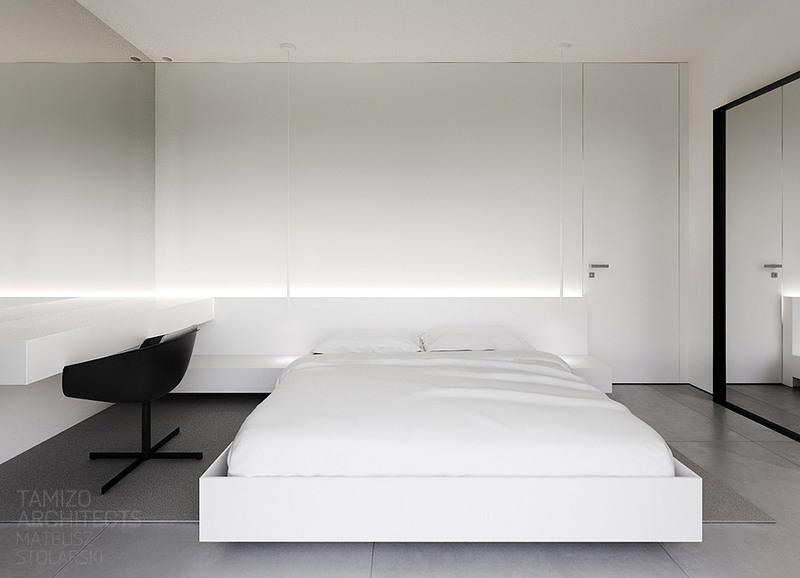 A white platform bed has a softly illuminated headboard that runs directly to a bedside desk that doubles as a dressing table. 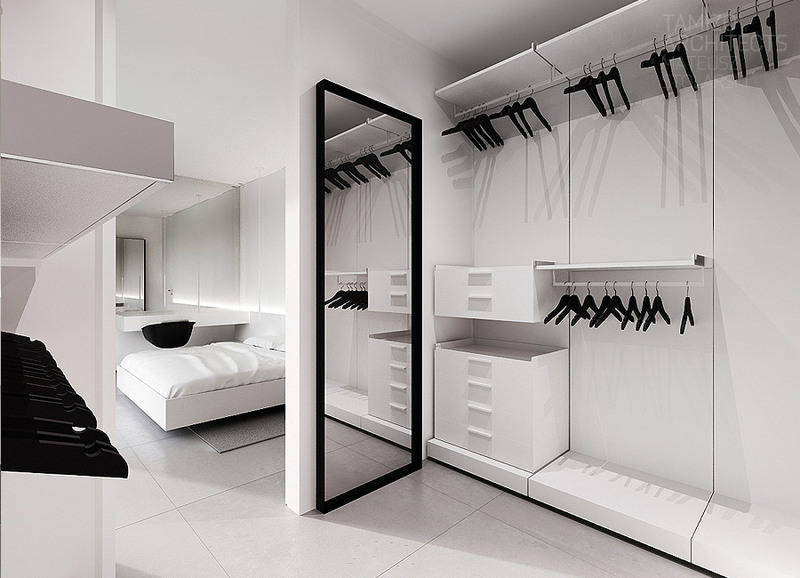 A mirror at each side of the room makes the space feel triple its actual width. Behind one of the mirrors in the bedroom lies an incredibly spacious walk-in closet, allowing the home owner to conceal all of their clothes and belongings in a superbly organized fashion.